Service Connected disability is a tax free monetary benefit that is paid to Veterans who incurred or aggravated a disease or injury in service and has a current diagnosis. Improved Pensions is a tax free, income based benefit paid to WARTIME Veterans and Surviving Spouses whose income and assets fall within certain limits for VA purposes Remarriage can affect eligibility of surviving spouse. 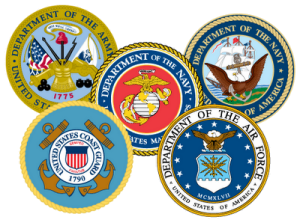 Dependency and Indemnity Compensation (DIC) is a tax free benefit paid to eligible survivors of military service members who died in the line of duty and eligible survivors of Veterans whose death resulted from a service related disability or who were rated 100% P&T for 10 years. Remarriage could affect eligibility. VA education # 888-GIBILL-1 (888-442-4551). Call between 7 a.m. - 6 p.m. Central Time, Monday-Friday. VA health care is NOT considered a health insurance plan. The VA provides healthcare through an annual enrollment system. This system is based on eight categories to ensure healthcare is available to all enrolled Veterans. Veterans may be qualified for cost free healthcare services through the VA based on income and service connected disabilities. The VA most of the time DOES NOT pay for unapproved hospital and doctor visits outside the VA Healthcare system. For rides to VA scheduled appointments the DAV provides transportation to and from and departs from the parking lot at the Dannie A. Carr Community Based Outpatient Clinic. There is no charge for this service and the scheduled route is on a first called first served basis. The DAV does not pick up at your home. It is strictly a facility to facility service and is staffed by Disabled Veterans who are VOLUNTEERs.